Sometimes it's dangerous to go into Anthropologie, especially when they are having a sale! Last weekend, was one of those times! I was doing some Christmas shopping and I thought I would just quickly pop into Anthropologie to check out their sale. There was nothing in particular that I was looking for, but I found a few treasures in the sale section, including this tulle skirt from one of my favorite designers, Eva Franco. Even though I don't need another tulle skirt, there was just something about this one that I really loved. That same day at Anthropologie, I also got a great denim jacket that will be making its debut on my blog later this week! So, perhaps you are wondering: did I get some gifts for other people? Well, not at Anthropologie, no, but I did at other stores. Truthfully, I feel that most people probably end up getting a little something (or more!) for themselves while doing holiday shopping, so I don't feel too guilty, especially when stores like Anthropologie are having fantastic sales this time of the year! Last of all, I am back at one of my favorite walls, which is located on the side of an apartment building in North Hollywood. 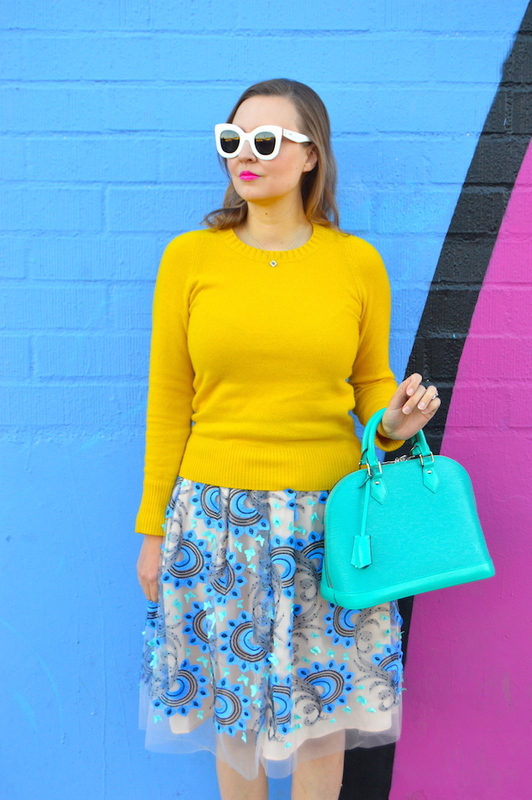 It feels good to infuse a dose of color back into my posts! During the holiday season, I tend to be clad in more muted colors and, of course, red. 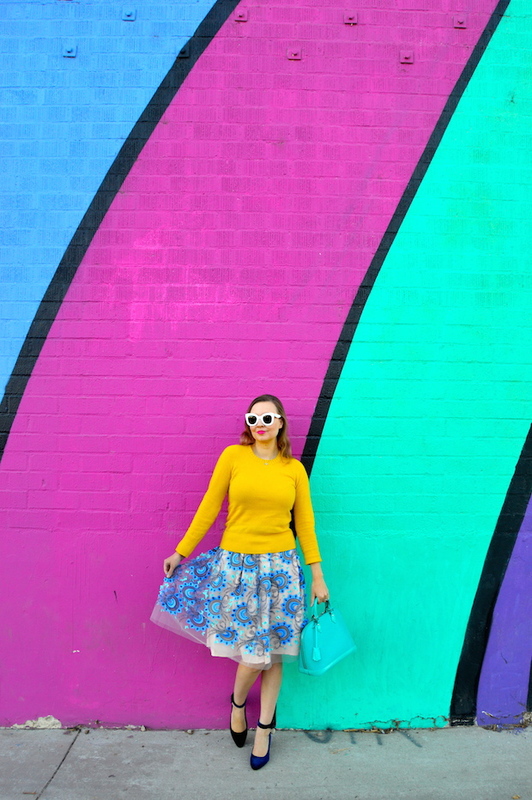 This post, however, is full of color! 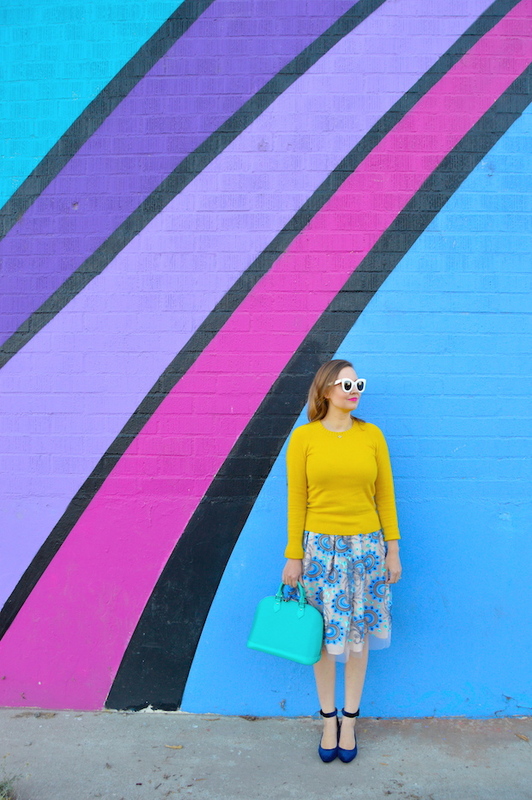 Since purple is my favorite color, this wall is one of my favorites in the L.A. area. I know I keep putting it off, but I do intend to post my "wall guide" to Los Angeles at some point, perhaps next week when I am on Christmas break! 1) i love the skirt. 2)paired with yellow is genius and good 3)now i have purple rain in my head, but purple rainbow! smart! 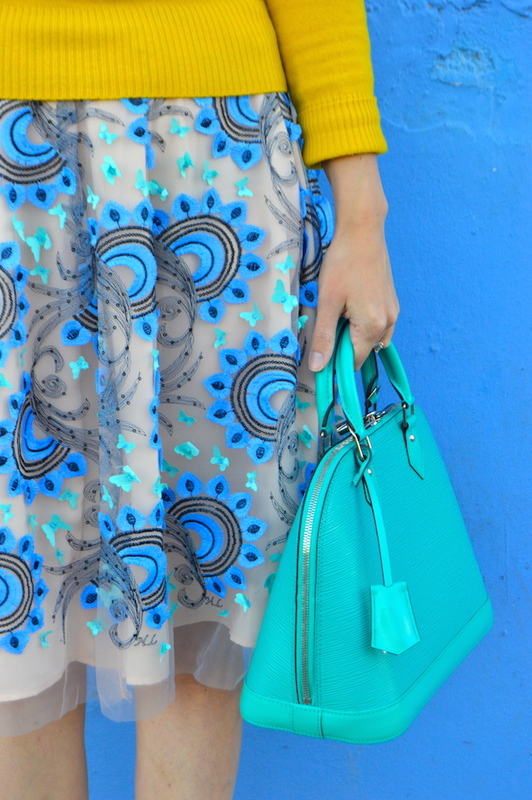 This skirt is just beautiful! 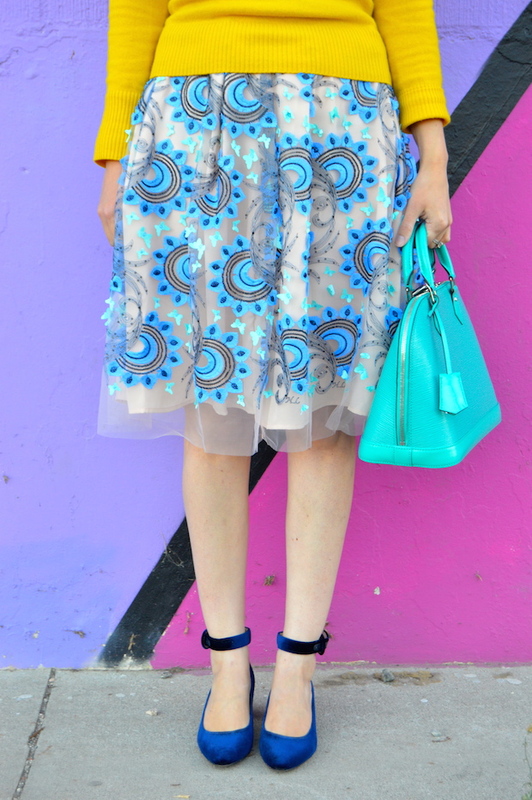 I love the pattern on the tulle and the yellow is so bright and cheery! Oh my gosh, this is so darling! 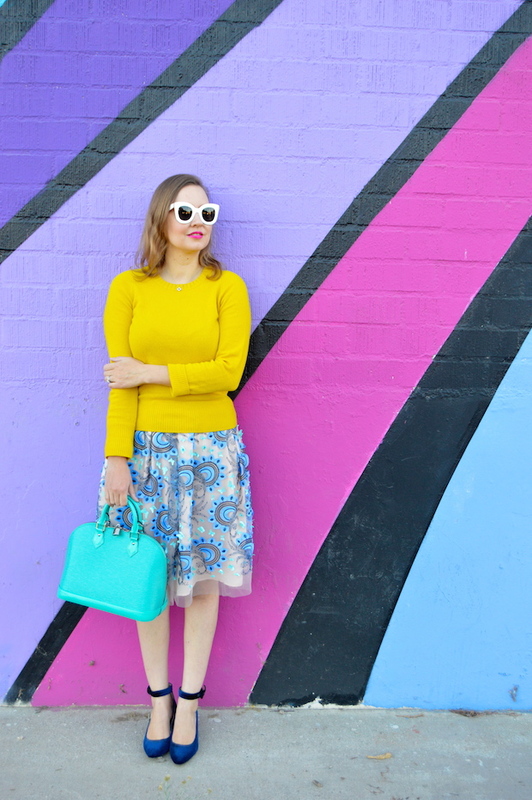 The patterned tulle skirt, the bright yellow sweater, and that amazing rainbow wall! I love it all! 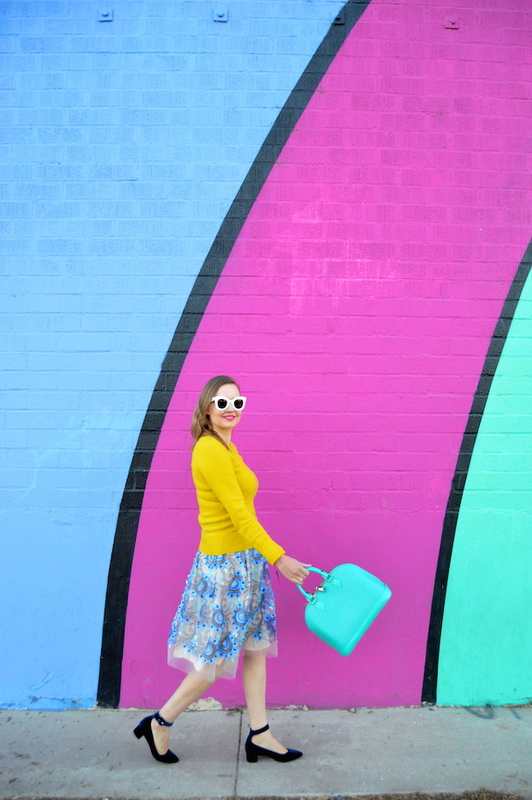 I found you from Jess' Turning Heads Linkup! I love the blue velvet shoes.. so stuning. I can see how you might be tempted into Anthro... love their clothes and the skirt's pattern really catches your eye1 Hope you had a wonderful Christmas!